Suddenly, two successive planes, which were actually captives from the Boston airport, the people on those planes were captured by terrorists, by trained terrorists, who committed suicide. They kept the people imprisoned in the plane, down to their arrival in the vicinity of Manhattan. And they circled around the building, and then the planes crashed into the specific towers. I watched this personally. I watched the whole problem of this, from Boston airport to the circling of the other targets. Nobody ever took any hand, no one—that is no official ever took any hand—to efficiently prevent those crimes against our citizens in New York City in particular. None! Other people also suffered, but these people were marked out. We’re talking about a major part of the New York population was murdered, by the orders of the Queen of England and the orders of the Saudis! And there has been no justice ever delivered to the citizens of the United States on that account this far. . .
What happened, was allowed to happen, under the Presidency of the United States, to allow citizens of the United States, to be murdered en masse by the hands of Saudi agents, and with the consent of the Bush family. And the Bush family was the author of this process, his father and his role; and what of the British? Same way! So when you’re talking about this kind of case, of 9/11, when you’re talking about that case, you’re talking about the greatest, single, peculiar kind of evil, ever perpetuated by the government of the United States, or by the willing consent of other people in the Presidency and so forth. . . There is no exaggeration. This thing was mass murder condoned by the U.S. government! Now when the U.S. government starts killing the majority of people in an area, that’s the issue! Not some entertainment. Not some kind of interpretation. I know the details of that thing thoroughly. I know it back and forth. I was a witness to it, because I had an access to getting a view of what was going on. And I know what some of the international effects of this thing were. So, if someone comes up with this issue, you’ve got to say—don’t say an explanation—say: “This was a murder, a mass murder of people in Manhattan.” There is no explanation, there is no qualification, there is no quantification. As a matter of fact, you have to make it worse than real, because of the implications of this: What do you think happens to people whose family members have been murdered, mass murdered? The fire department officials, mass murdered! And they were mass murdered! I know what the buildings were! I had walked through those buildings before the event occurred; I had lived at an earlier point in that area! I knew the thing intimately. And you cannot say anything good, anything productive, anything useful, which does not simply say, these citizens of Manhattan were murdered by the consent of some officials of the U.S. government. 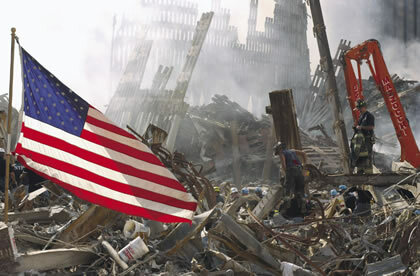 How many Americans have given more than a passing thought to what occurred on that day, and to its aftermath? Who has thought about the hundreds of people on airplanes, traveling for business or family affairs, kidnapped by terrorists and smashed into their fiery deaths? What small or large heroic acts did each of them take in their final moments, from calling a loved one, or giving comfort to a terrified fellow passenger? What about the people who came in to work on that beautiful clear September morning at the World Trade Center or the Pentagon? Who were they? What contributions would each of them have made to mankind had they lived? What about the brave first responders, rushing to the scene, guiding injured people through the ashes and smoke to safety, and then returning to rescue more, only to die in collapsing buildings, or to die later because of poisons they inhaled on that fateful day? 9/11: the greatest evil ever perpetuated by the government of the United States, by the willing consent of people in the Presidency. Here, FEMA search and rescue teams clear rubble and search for survivors at the World Trade Center. What about our sons, daughters, husbands, and wives in the armed forces who have died in wars based upon lies? And who will think about all of the thousands upon thousands of men, women, and children killed abroad in these wars, while the actual organizers and financiers of the September 11, 2001 attacks have been protected by two successive administrations of the United States Government? Now, either justice will be done, or we will all perish in the inferno of thermonuclear war—because the continuation of the crimes of September 11, 2001 will lead us there. Even without the release of the carefully guarded 28 pages of the 9/11 Congressional Joint Inquiry, what is known about the attack is enough to land both George W. Bush, Barack Obama, and several members of their respective administrations in prison for the rest of their lives, had anyone in Congress the courage and integrity to pursue it. For example, within days of the attack, it was known that 15 of the 19 hijackers who captured the planes were from Saudi Arabia. It is known that immediately following the attack, when supposedly no planes were allowed to fly, members of the Saudi Royal Family, as well as relatives of Osama Bin Laden, managed to be flown out of the United States back to Saudi Arabia and other locations. As former U.S. Senator Bob Graham—who chaired the Senate Select Committee on Intelligence and co-chaired the Joint Congressional Inquiry—has said repeatedly, many of these hijackers did not even speak English. Who helped them establish themselves here? Who paid their rent? Who organized and paid for their flying lessons? Later it emerged that there were several key areas from which these hijackers operated. Among them are Sarasota, Florida; Paterson, New Jersey; San Diego, California; and Falls Church, Virginia. We know that when Senator Graham and others tried to pursue these leads, they were blocked by the FBI, as in the case of Sarasota, where the FBI denied there was anything of interest about a home in a gated community which had been visited on several occasions by lead hijacker Mohamed Atta and several of the other hijackers. Only recently, after an FOIA request from the Broward Bulldog, a local newspaper, did the FBI admit to having 80,000 pages of reports on investigations pertaining to that location. How can it be that fifteen years after the mass murder of thousands of Americans on American soil, not one member of Congress has demanded justice for these people? How can it be that the American people have allowed two successive Presidents of the United States to withhold the truth, and not only to withhold the truth, but to act repeatedly to protect members of the Saudi Royal Family who are directly implicated in this crime? Is this not treason? Compare the treasonous cowardice shown by the leaders and citizens of the United States over the last fifteen years, to the actions taken recently by President Vladimir Putin of Russia. In contradistinction to the treasonous cowardice shown by the leaders and citizens of the United States over the last 15 years, Russian President Vladimir Putin on May 5 organized a Classical music concert in Palmyra, Syria, as a tribute to those who have died in the war against ISIS. Distinguished Russian conductor Valery Gergiev conducted the living memorial concert in a nearly 2000-year-old amphitheater in Palmyra, Syria, in which Isis had executed dozens of people. The Palmyra concert, described by Putin as a tribute to all those fighting terrorism, opened with the Chaconne for unaccompanied violin by Johann Sebastian Bach. On May 5, President Putin organized a unique tribute, a living memorial, in honor of those who have died in the war against ISIS in Syria: A concert, directed by distinguished Russian conductor Valery Gergiev, was held in ancient amphitheater of Palmyra, an amphitheater nearly 2,000 years old, which ISIS had attempted to desecrate by executing dozens of people within its walls, including the archaeologist-custodian of the Palmyra ruins, 81-year-old Khaled al Asaad, who ISIS tortured and beheaded for refusing to reveal where he had hidden many treasured artifacts. The program yesterday in Palmyra was incredible. It was indescribable, really. The concert opened with the Chaconne by Johann Sebastian Bach for unaccompanied violin. The video footage of it is breathtaking, in aerial views that have the ruins of ancient Palmyra with the orchestra seated right in the middle, and one lone violin, playing this sublime piece by Johann Sebastian Bach. This piece was followed by an excerpt from an opera by a modern Russian composer, Rodion Shchedrin. The opera is called Not by Love Alone. And then the final piece on the program was the First Symphony of the famous Russian composer Sergei Prokofiev. This is the work known as The Classical Symphony, a name that Prokofiev gave to it himself. He modelled it as his homage to the works of Haydn, Beethoven, and Mozart. 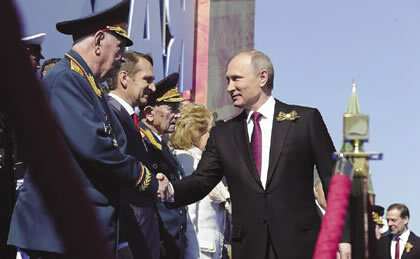 In the beginning of the event, Russian President Putin was streamed live into the amphitheater there, and delivered a prayer in which he situated the significance of this concert. He began by saying, “This concert should be a sign of our gratitude, remembrance, and hope.” He said, “I see this as remembrance for all victims of terror, no matter the place and time, of crimes against humanity, and, of course, of hope, not just for the revival of Palmyra as a cultural asset of the whole of humanity, but for modern civilization, from this horrible fate of international terrorism. Today’s action involved major inconvenience and dangers for everyone, being in a country at war, close to where hostilities are still ongoing. That has demanded great strength and personal courage from you all. Thank you very much. President Obama wanted no part of a true anti-terrorism coalition called for by Putin, and recently Obama’s Secretary of State John Kerry demanded the ouster by Syrian President Assad by Aug. 2, setting up a strategic confrontation with Russia. 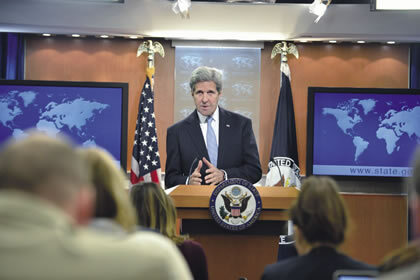 Here, Secretary of State at the State Department daily press briefing, May 3. Putin was uniquely qualified to make these remarks at this solemn occasion because it was his decision to act against ISIS, which he announced in September 2015, that led to the liberation of Palmyra and many other cities in Syria which had been captured and destroyed by the terrorist scourge. It should be remembered that when President Putin announced the formation of a true “anti-terrorism coalition,” President Obama wanted no part of it, and even attempted to sabotage the Russian efforts by supplying the ISIS-supporting regimes of Turkey and Saudi Arabia with weapons and intelligence. Just last week, Obama’s Secretary of State John Kerry demanded Syrian President Assad’s ouster by August 2, not only thus jeopardizing the fragile ceasefire, but putting the United States in a direct strategic confrontation with Russia. Under Obama, the United States is now allied with, arming, and supplying the very terrorists who murdered our own citizens on September 11, 2001. President Abraham Lincoln took personal responsibility for those soldiers who had sacrificed their lives. His agony is seen in the Gettysburg Address. 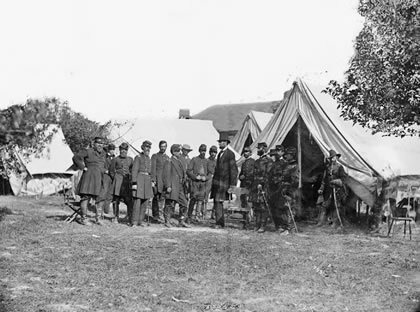 Here, Lincoln is meeting with his military leadership from the main eastern theater of the war, at the time of the Battle of Antietam, the bloodiest single-day battle in American history, 1862. If one takes a moment to reflect on the Gettysburg Address of American President Abraham Lincoln—who fought and defeated the British Empire in the so-called “Civil War” of the United States—the power, the wrenching emotional impact, of that dedication is to be found in the agony of a President Lincoln who took personal responsibility for those soldiers who had sacrificed their lives in the fight for freedom. He led our Republic to victory in the war, and himself paid the ultimate price when he was assassinated in 1865. This is not a time to “blame the government.” It is a moment to look into one’s own soul. Millions of Americans have allowed themselves to become “accessories after the fact” to our own government’s complicity in the mass murder of 3,000 of our fellow citizens. We our­­selves become criminals by condoning the crime, through our silence.